Based on client feedback, last week we pushed an update to dsSearchAgent v3 that improves some of the aspects with registration. When a registration dialog is launched because of a view/search constraint, the visitor is no long able to close the dialog via the [X] icon, nor by pressing the [escape] key. When a visitor searches or visits a listing we now save the count in a browser cookie, so that we can prevent loopholes in forced registration. What we’re looking for is real numbers to determine if this is helping you guys out. We want you to be able to capture registrations better, but also, track registrations better. In addition, we’re also interested in hearing what other types of Google Analytics events you might be interested in. You can head over to our Community Forum Thread and let us know there or simply comment on this post. **Note: The way “IDX/Open Visitor Registration” and “IDX/Open Visitor Registration/Required” work is as follows: When the registration dialog is opened, whether it’s via the user’s interaction, or via forced registration, the vent “IDX/Open Visitor Registration” will always be fired. IF the dialog was forced, we will fire an additional event of “IDX/Open Visitor Registration/Required.” This is so you can track all registration dialog opens, but also the detail on which were forced or not. ***Note: “/IDX/Abort Visitor Registration” is tracked as a page-view and not an event because it’s actually been around for a while, pre-events in analytics, so we didn’t want to mess up anyone’s existing tracking. dsSearchAgent is the complete IDX search solution that engages visitors with powerful features in a map-based interface. Now featuring dsSearchAgent Mobile! And more… Click here to learn more about dsSearchAgent Pro (for a limited time, all dsSearchAgent accounts receive the full version of our new dsSearchAgent Mobile product). It’ll be interesting to see how the capture rate changes with this. I’m currently at about 5% based on how I have my setting setup. Curious as to what many users are using for the registration options and also when I click on the forums tab there is a 502 errors. 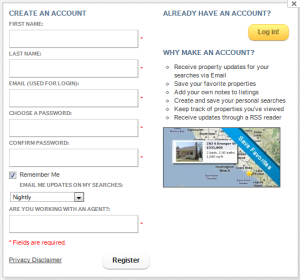 can you add the two-step method back into the registration panel?